Marvel Minimates 2-packs based on the rich comic book history of Wolverine! Weapon X Wolverine, Lady Deathstrike, the Silver Samurai, Mojo, Spiral, and more. Mini-figures feature up to 14 points of articulation and fully interchangeable parts. Series 72 case contains twelve 2-packs. Wolverine is the best he is at what he does, and his enemies aren't bad at it either! This cool assortment of Marvel Minimates 2-packs is based on the rich comic book history of Logan, aka, Wolverine. 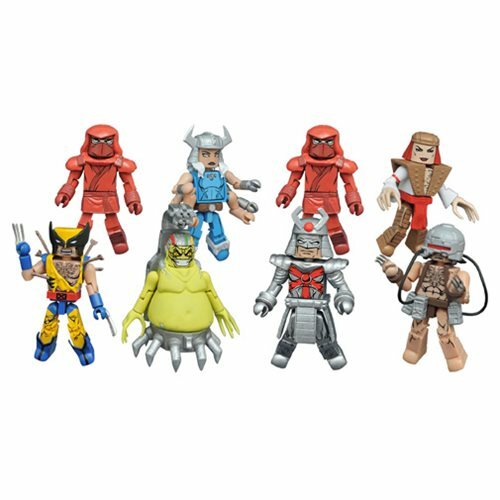 Each 2-inch tall mini-figure features up to 14 points of articulation and fully interchangeable parts that include removable helmets, armor, and weapons! Each 2-pack comes packaged in a full-color window box. Ages 8 and up.